After purchasing an already established company Coast to Coast Murphy Beds needed rebranding and a more functional e-commerce solution that could accomodate the custom-tailored needs of each of their customers. Their beds are made to fit into specific places, and the design of their e-Commerce solution needed to be just as specific. We worked with them to create their new logo and color palette so that it would appeal to their upscale target demographic with a sleek modern look. We knew we needed a very visual strategy for their website. People aren’t going to buy these beds from reading descriptions of them, they need to see how awesome and innovative they are with their own eyes! In order to make an e-commerce solution that was going to be effective we needed to understand more about their customers and how they thought. Too many choices at once can be overwhelming. That’s why we did some research to find out how it made the most sense to customers to have the form laid out. It needed to feel like a natural progression with a logical progression to it. Their logo is now a modern design that also showcases the versatility of Murphy Beds. You can take a look at the upper left-hand corner of the picture above to see it in action. Their website is now more secure, has faster loading pages and more streamlined code despite being focused heavily on images to display their beds. While doing our customary search engine optimization for the site we made sure that people would have plenty of visuals to find the option that was right for them to customize. It’s much easier to see the differences in beds than effectively describe them. It’s also a lot easier to see how they fold up than to describe it. We also designed a process that would guide users through the decisions they needed to make to get their bed customized just the way they wanted it. 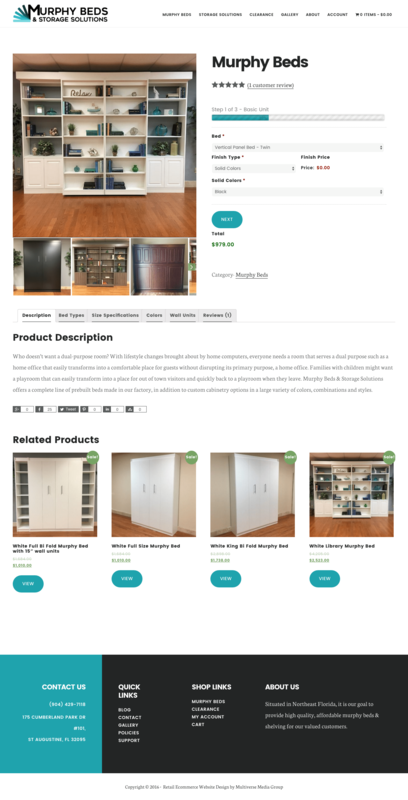 Their previous site and other Murphy Bed’s sites tend to only allow very basic choices, but for this site, we went above and beyond to allow customers to put in full custom orders that could utilize the full ability of the craftsman who makes them.